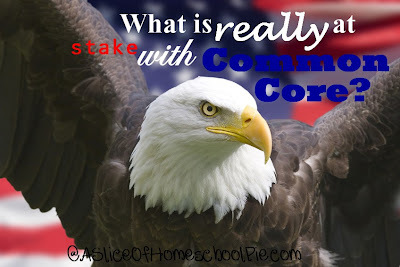 A Slice of Homeschool Pie: What is Really At Stake with Common Core? What is Really At Stake with Common Core? "Today the United States Sixth Circuit Court of Appeals will hear oral arguments in the case of Romeike v. Holder. While this is an asylum case precipitated by a German law, its outcome could greatly impact American parental rights law. ParentalRights.org President Michael Farris is representing the family in court. At issue is whether or not a parent has a prior right to direct the education of his or her child – whether a parent’s human rights include the right simply to decide where their child will attend school, and what kind of education the child will receive. The Romeikes fled Germany in order to home school their children in accordance with their deeply held religious beliefs. Under German law, all children must attend state-funded schools and learn what the government wants them to learn. So the family made a legal visit to Tennessee (visas, passports, etc.) and filed for asylum while they were there. The amnesty court granted their petition, finding that Germany’s law violates the family’s prior right to determine the kind of education their children would receive. But the Administration appealed through the office of Attorney General Eric Holder. Today is the day that appeal is to be heard." What does all this have to do with Common Core? Let me reiterate this part of the e-mail, Under German law, all children must attend state-funded schools and LEARN WHAT THE GOVERNMENT WANTS THEM TO LEARN. Citizens of America, don't you see that this is EXACTLY what is going to happen by allowing our states to implement Common Core? Our government will have our children learn what THEY want our children to learn. I wish people could see past the academics, whether they're good, poor, or mediocre isn't the biggest issue facing us here. I do believe this is what school administration will focus on, but what about what is being given away? What about our children's privacy and freedom? What about our privacy (Are you aware that the House dismantled the fourth amendment?) and our freedom? I hear supporters speak of the bells and whistles of the new math and science programs. I'm curious about the History program? I would love to see what Common Core plans to implement for history. If our children don't know the truth about our past, how will they know what is best for their future? Our children's minds are sponges, do you really want the information going into their minds to be information provided (or approved) by our government? As a parent I do not want my government to be involved in our state schools. I do not want to give the government access to my children's minds. I don't know who our next President will be. What if he is of a totalitarian mindset? Or what about the President after that? Are we setting up our children to be easy targets of this type of leadership? in exchange for a "better" education? I do not want my government involved in OUR schools. Do you?